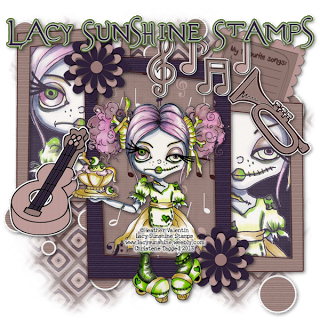 to Black DSP; Big Shot; Lucky Stars Embossing Folder; SU! It's time for a new challenge @ Crafting When We Can & our theme for the next 2 weeks is black and white! Our sponsor is Lacy Sunshine & I was given the super cute Eleanor Trick or Treat Flight to play with--THANK YOU!!!!! She was perfect for me to try my hand @ some sort of black & white....I only used color for her skin, eyes and candy & I think she came out pretty good for my first time!!!!! My teammates also made some awesome creations so check out our blog to see what they came up with & while you're there; read up on our rules so you can play along with us! I'm looking forward to seeing your *black & white* works of art....have fun everyone & happy stamping!!!!! Love it! Beautifully colored image, Jackie! Gorgeous Jackie....love the funky images and love black and white!! This is awesome Jackie! I love the sentiment that you used....too funny :-) Beautiful job as always. Love the way you colored this image in shades of grey and adding green color to her skin - it's different, fun and looks great! And that sentiment is so funny! I really like this card, Jackie! So cute!!! Great coloring! Love it!! Thanks so much for playing along with us at Open-Minded Crafting Fun Challenges!!! Good Luck! I hope we see you again!! Gorgeous card. Love the sentiment! Great coloring. Thanks for joining our Include a Hat Challenge at Lace Sunshine. Good Luck! Gorgeous! 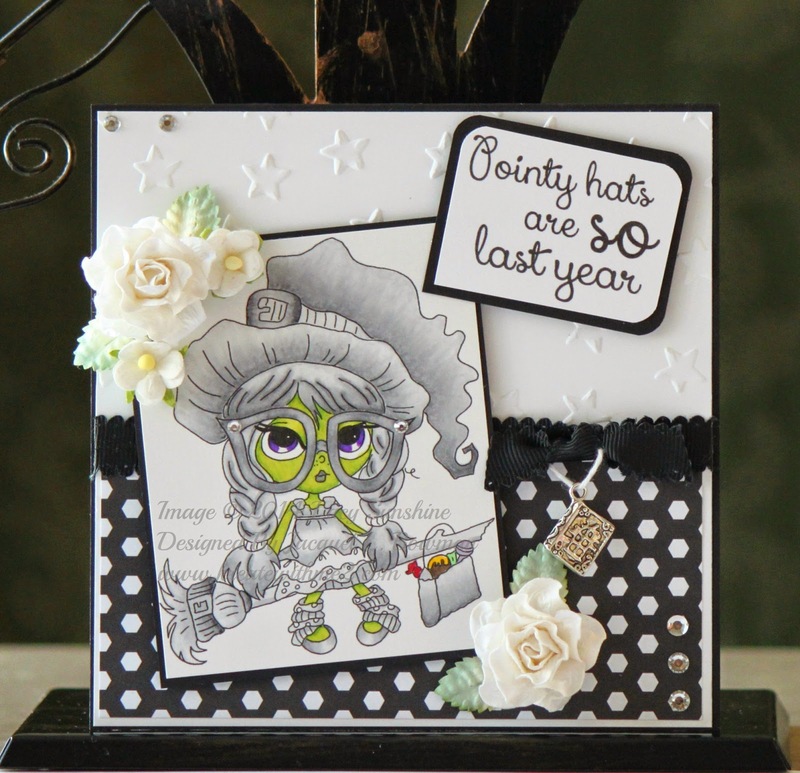 Thanks for sharing your fabulous card and joining us for our current challenge at Inspiration Destination. Hope to see you again and good luck! Fantastic card, Jackie! Her skin is awesome! Lovely card with a fabulous image. Thanks for joining us at The Paper Shelter. Fantastic! I like her green skin and the brightly colored candy popping out of her bag. Hi Jackie! I love that image, and the green is so perfect! I think it was a great idea to only color her skin, eyes, and the candy! It just pops! So beautiful Jackie. I love the mono coloring and such a super sweet image. Great card, love the little hint of green. Your coloring is fabulous! Love the great texture of the embossing! Gorgeous card, fab design. Thanks for joining us at AGOAC. Good Luck! Perfect card for our challenge. Awesome job! Thanks so much for playing along with us at Open-Minded Crafting Fun Challenges!! !